Thanks for following along with itch.io week. As a reminder, each day this week we’ll be revisiting some part of itch.io with upgrades and releasing developer interviews with members of the itch.io community. We’ve completed rewritten the app from the ground up to provide an entirely new streamlined experience. In addition to solving hundreds of bugs and getting community translation for 20 languages, we’ve integrated much of the core functionality of itch.io directly into the app. You could always search for specific games you wanted, but now we’ve packed the entire store right inside the app. 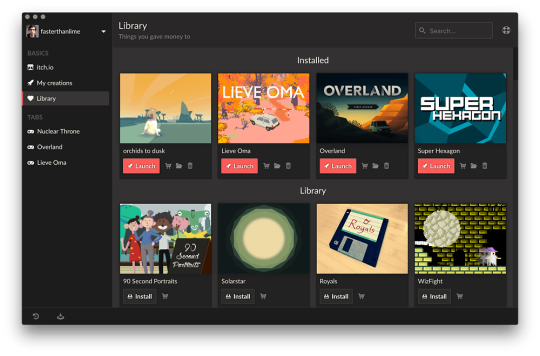 This makes it easier to directly add free games to your library without leaving the app, browse our storefront or use the randomizer to find something new. We’ve done this by implementing a browser directly into the app. This means you’ll see developer’s game pages exactly as they were intended, along contextual actions in the app’s toolbar for downloading, launching or buying. Enjoy some of the beautiful pages that creators have made. 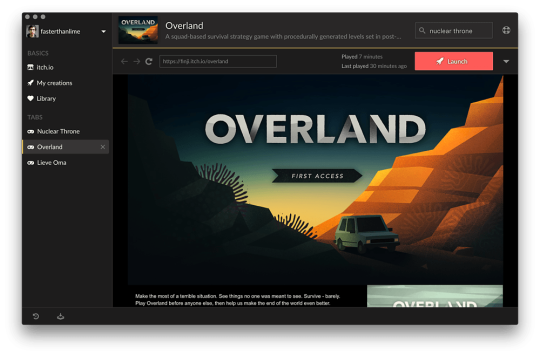 The app can now download browser based games for offline play. Sometimes (especially with game jams) some of the best games are made for browsers. Now the itch app supports playing these games in-app, even offline. Take a look at some of the recent Ludum Dare submissions to find some great examples. Lastly, the app is now fully aware of game updates. If any of the games in your library need an update the app will take care of it. The new downloads tab will summarize any things the app might be fetching. Even the app itself will automatically update. BTW: if you already have the app installed just boot it up to automatically update. Ditto is one of our favorite creators, and we’re really excited about this next game, GoNNER. He talks about some of his experiences releasing his games, and transitioning to a publisher. That’s all for Monday, see you tomorrow.